Our Ch. Pl. FANABERIA Tellus Mater has seven beautiful, colorful puppies. September 22, 2018 our Ch . 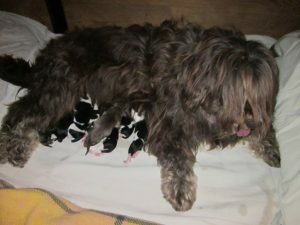 Pl., DA FANABERIA Tellus Mater FCI (O; Mieszko z Norblińskiej Doliny M: Żeglarka Gaździna z Banciarni FCI) gave birth to puppies. The happy father of puppies is Mł. Ch. Pl., ECHO JUHAS Banciarnia FCI (O: Grajotko Wataha Fuksa M: Idylla Bacówa z Banciarni FCI). We have seven colorful puppies; 4 males and 3 females. All puppies have long petioles and cheerful faces. They are white-black, white-gray, black, chocolate and white-chocolate. We invite your to from Banciarnia, individual photos of puppies are on the subpage about puppies.